This post has been 9 long months in the making and I am happy to say, after much debate and bickering discussion, we are the proud owners of new kitchen countertops! 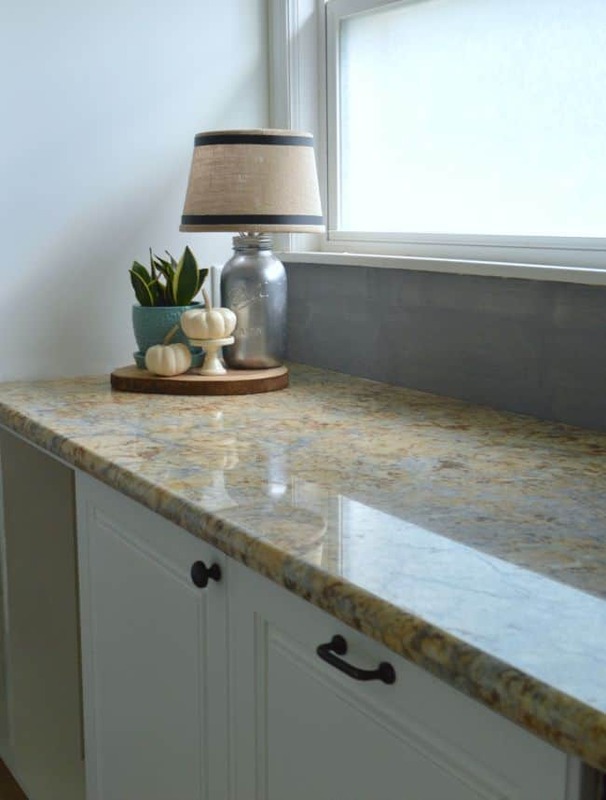 After we started the reno I shared a post with ideas for countertops and materials that I liked and, although I was really set on marble and the hubs was set on concrete, when it came down to it, we went with something different…granite. I want to fill you in on the how and why of our choice, but today I just wanted to share the process of putting them in. 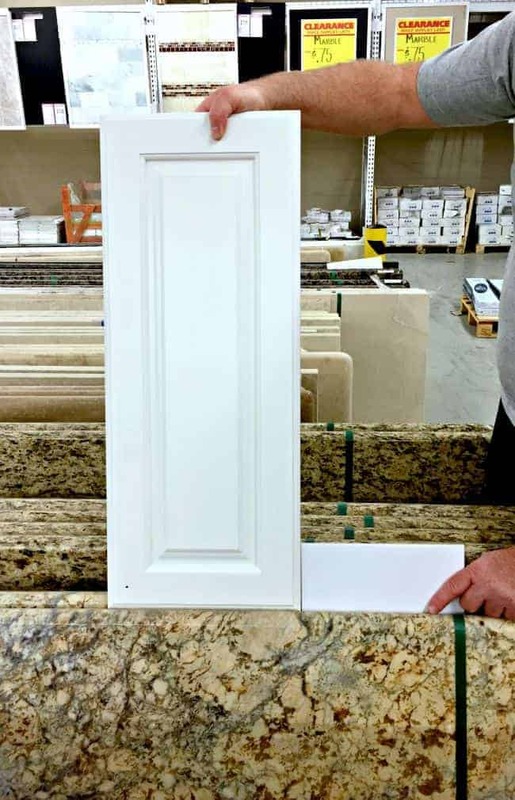 I will tell you that cost was a huge determining factor in our choice and, because we got a great price on the granite, the rest was up to us. 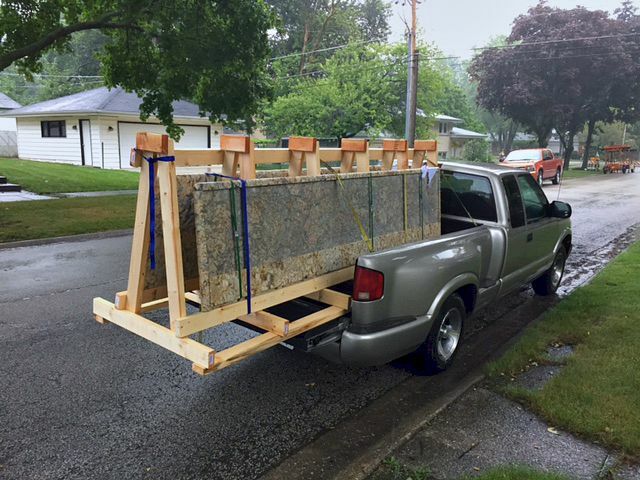 This meant, transporting the granite slabs to our house, cutting them to fit in the kitchen and installing them. 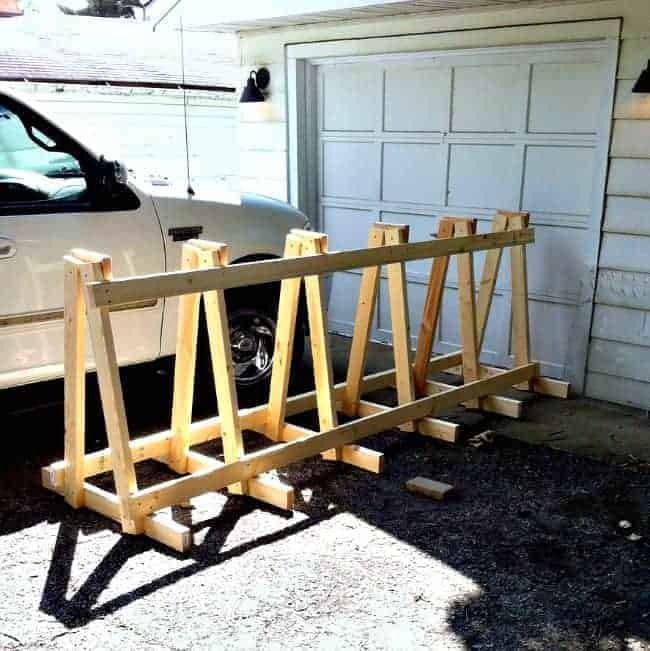 The first thing we had to do, before we could pick up the granite at the store, was to build an A frame so we could safely transport it home. After getting our pieces home, the hubs and a friend carried those beasts up to our deck. This is where we set up a staging area to cut them to size. Before we could even start cutting the slabs, we had some prep work to do in the kitchen. 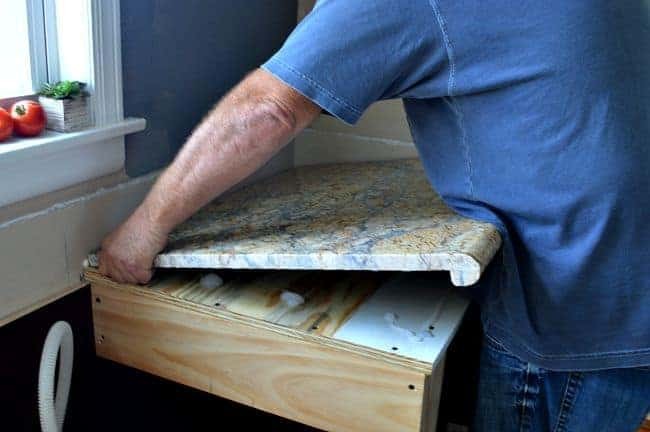 We started by removing the old sink, backsplash and countertops, and then we cut and installed plywood on each cabinet base for the granite to sit on. 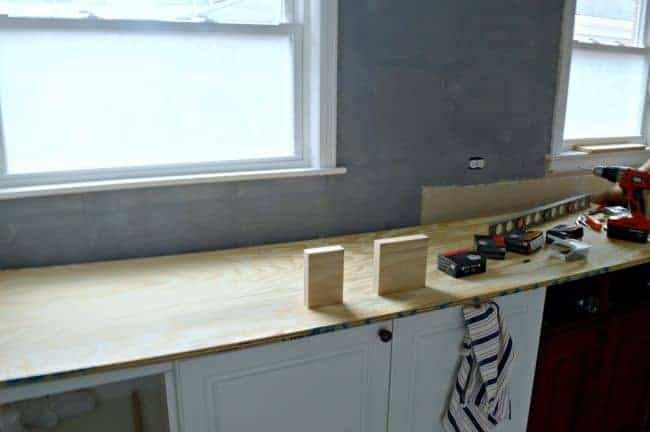 Once all of that was done, we had to make sure that the plywood surface was level for the granite and, if it wasn’t, we would have had to add shims under the plywood to level it out. Luckily, our surface was level so we didn’t have to use shims. After the prep work was done, we were ready to cut our granite. One of the most important tips I can give you when cutting granite is to measure, measure, measure. 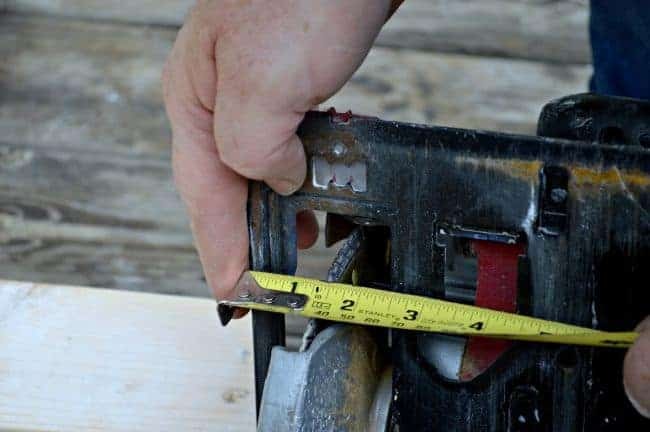 And, when you think you’ve got it and you’re ready to cut, measure some more. Cutting the granite was definitely the most stressful part of this project. The fact is that you only get one shot, and there’s always the possibility of chipping or breaking. It took us two long and tense weekends to do all the cutting, and we were both so relieved after the final cut was made. 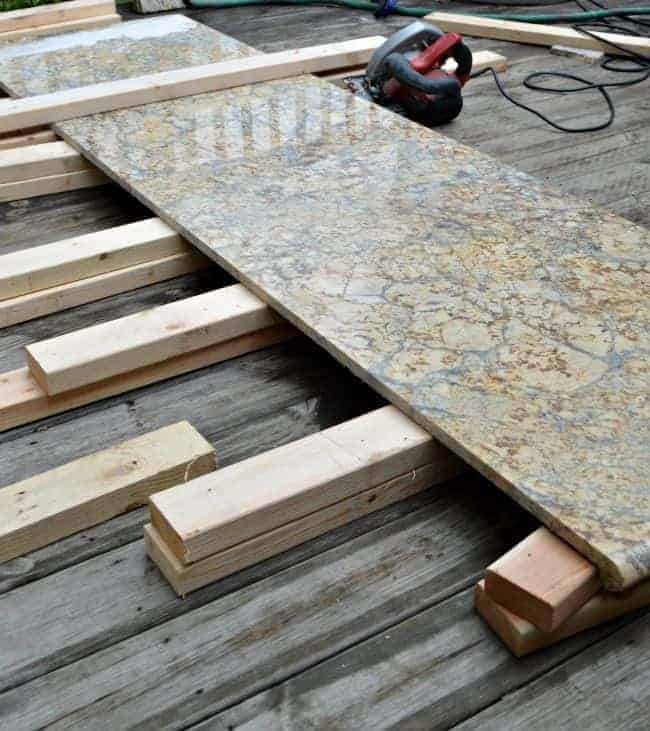 Once we had the granite cut and we tested the fit, it was time to glue it to the plywood we installed. 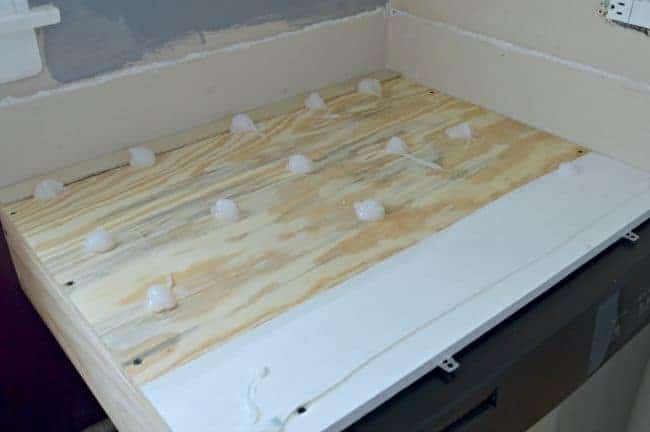 We used tub and tile caulk to”glue” the granite to the plywood, because there is water and moisture from the dishwasher on this side of the room. We also painted the plywood that sits above the dishwasher to prevent the moisture from causing the wood to swell. Out of the two slabs we bought, we cut out four pieces and glued them in place. That’s it for the installation. We still need to buff the rough edges that you can see by the stove, but the hard (and stressful) part is over. The whole point of this kitchen reno was to get more counter space so there could be more than one person in the kitchen at a time. Before the new cabinet was built and the countertops installed, we had 29 inches of prep space on the left side of the sink. 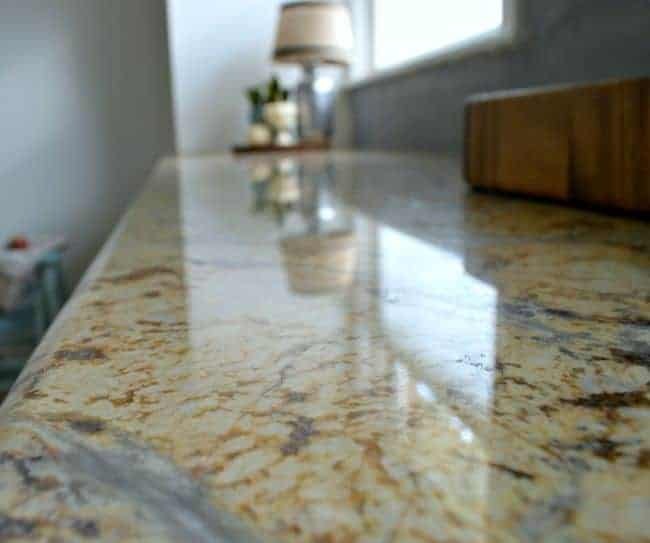 This was the first time we’ve ever done a project like this, and it was a tense two weeks while we were cutting and installing the granite, but the money we saved doing it ourselves made it all worthwhile. Next project is the tile backsplash. Slowly but surely we’re getting there. This is my first time having granite in the kitchen. Any tips on upkeep? 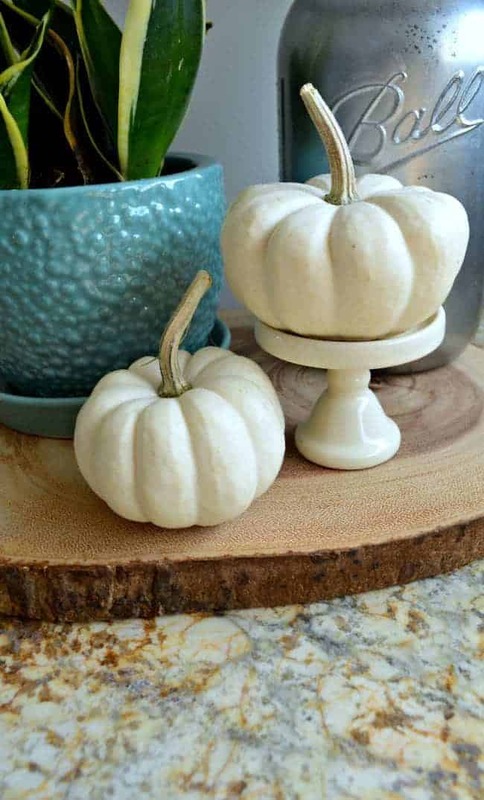 love the graining on the granite you chose and how it kind pops and blends with the white at the same time! I came over from Nancy’s ‘Joyful Cottage’. Loved seeing your home there and really enjoyed reading a bit more here. You were brave to cut your own granite. You almost inspire me to think we may do the same some day! I’ll be back again to visit. 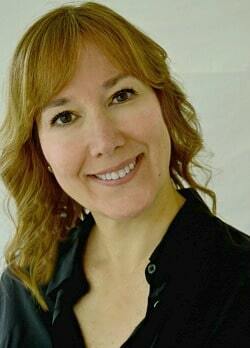 Hi Adrienne and welcome! 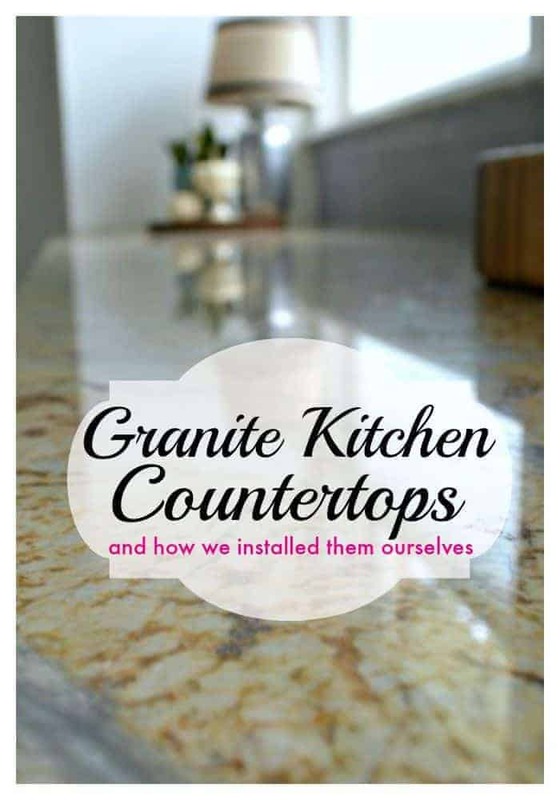 So glad that you stopped over from Nancy’s fabulous blog to read more about our countertop adventures. I popped in to your blog and have been enjoying your posts on Daffodil’s Journey. We dream of restoring a vintage trailer some day, so it’s been fun reading up on her transformation. Thank you for visiting and happy trails with Daffodil! Thanks so much Nancy! Having the extra counter space truly feels like a luxury. It’s wonderful that we can both be in the kitchen preparing food without taking turns. 🙂 We’re proud of our accomplishment now that they’re in, but there were moments when we wondered if we were foolish for doing it ourselves. I know what you mean Jessica, it was a tough one to get through but we came out on the other side. 😉 We love all the space that we gained and I’m sure it won’t take but a second to fill it up. Thanks for checking them out and I hope your weekend is great! HAPPY ANNIVERSARY! Hope you both enjoy your cruise. 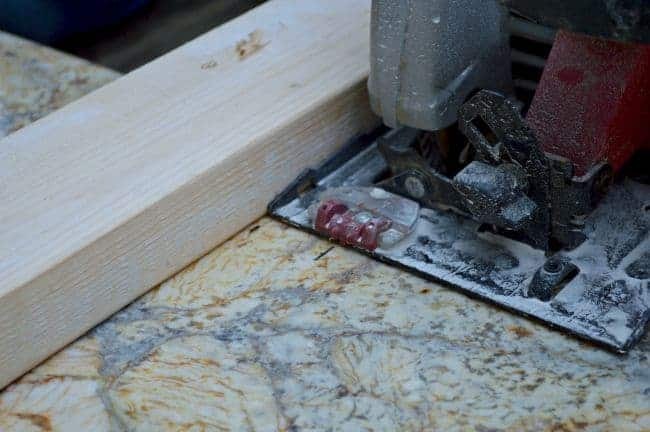 I saw “new countertops” on your feed and I had to click on it to see. I love them and you two were brave to install yourselves! Good job! Enjoy! Thanks so much MJ. We enjoy cruises and I have no doubt that this one will be great. I’m glad you came in to check out our new addition. It seems like we would never get to this point and now I’m ready to move on to the next task. It’s always great to hear from you and I hope you have a great weekend! What a fabulous job, Kristi…and a totally fabulous choice! 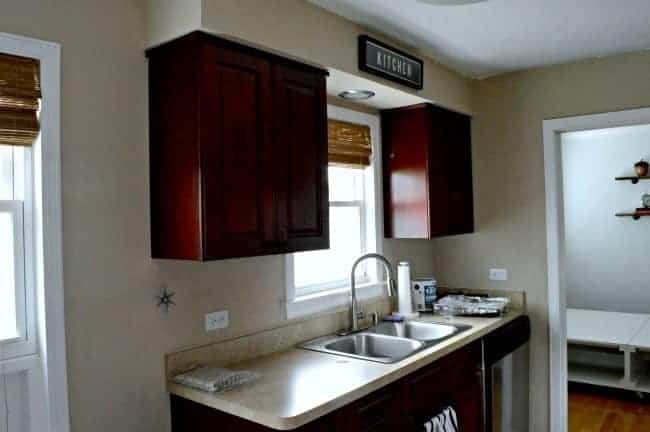 I bet you are so thrilled to have the countertops in and the cabinets done. 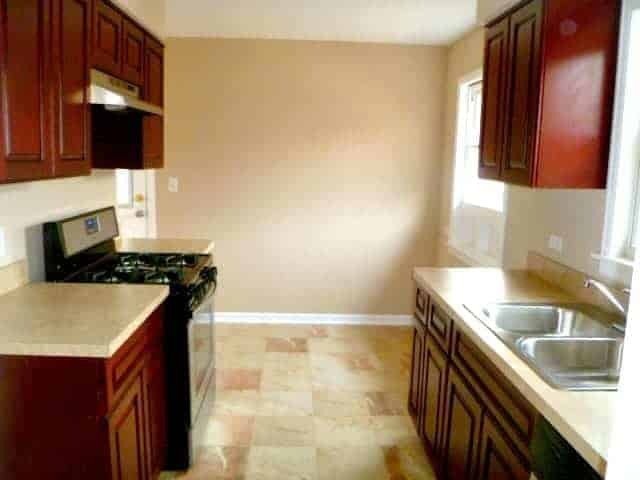 Your kitchen completion is on the horizon! Yay!! Thanks so much Kim! They’re not what I thought we would end up with but they were the right choice for us. I’m excited to see the them with our tile choice. Still biting my nails but it seems to be coming together. I am so impressed that you and your hubs installed the granite yourselves. You did a fantastic job. I would have been in panic mode from the transportation of the stone to the cutting phase. Have a wonderful vacation and Happy Anniversary! BEAUTIFUL !! Love the pattern you decided on. Have a great vacation, you two deserve it. Wow, y’all are mighty brave doing that yourselves. They look fantastic! I know you want to hug them. Ha, either brave or very stupid. 😉 Thanks Kim!